Photo Courtesy of Hot Rod Network "This Guys Garage - SharaDon Performance"
From the Hot Rod Network article (written by Douglas Glad on November 4, 2014): Remember back to the June 2014 issue of Car Craft where we showed you Brian Lofquist, Derek Peterson, and Tremayne Brown. These three guys had some serious homebuilt turbocharged street cars that we shot in 2013 at the Car Craft Summer Nationals for the cover of the magazine. This year, Brian invited us to the place where it all began, SharaDon Performance in Hugo, Minnesota. 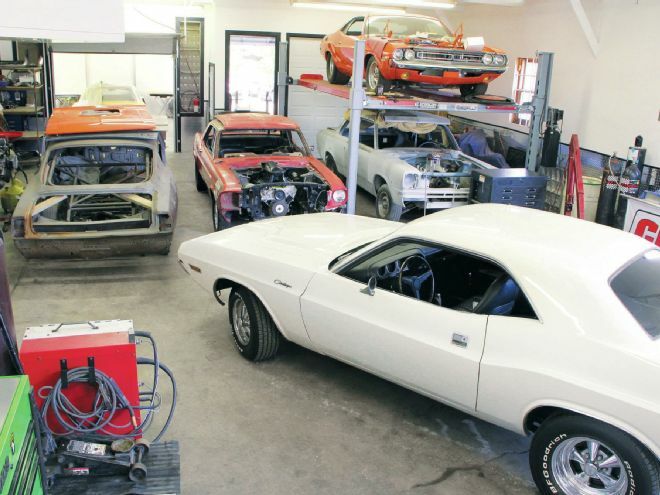 Inside we met owner Don Baierl...who gave us a tour of this Mopar-lover's dream shop. There was more square footage than we could get in one frame, so we decided to show what they had hidden in the back. This page will feature projects that SharaDon Performance engineered (there are a lot of them, so check back soon). Don Baierl raced the car described in the HotRod Network for over twelve years, running in the mid to high 10s.